The bird balloon works on the same theory as the CD’s. That birds are naturally sensitive to movement and their first instinct to deal with potential dangerous situations is to avoid them by either walking or flying away. This time, not only does the balloon use a reflective foil to create an irritation to the birds. 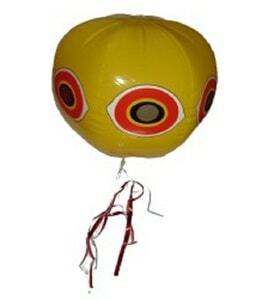 The balloon is tied so it moves in the wind, and it also uses the eye shape, which also is designed to scare away the birds. Simply inflate the balloon, then attach the stickers and ribbons which come in the packet. There are a few ways you could hang the balloon, the bird balloon comes with some small string and has a loop on the top of it so you can hang it from a tree or a high place. I don’t have any trees on my property, I decided to run some fishing line about 10 meters in between my carport and fence, which happens to be on top of the area of seed I want covered. When the wind blows the balloon and moves it, I will also move a little along the line which will keep the birds guessing, I’m hoping. The balloon came in a small packet which was handy. 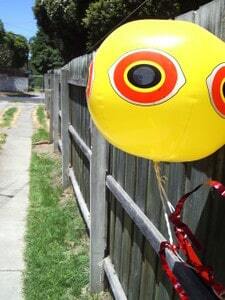 I put the balloon up and put some seed on the ground, watered it and walked away. The next day I didn’t see any birds over the seed, and with the wind blowing a little bit I saw the balloon and streamers move around. Awesome, I thought, Its moving, it’s doing what it does! And the bird balloon was awesome until I came home from work the day after I put it up. Coming down driveway I saw birds eating the seed right under the balloon! And there had been birds on the seed all afternoon, my wife told me. My faith the in bird balloon was waning. Over the next few days the birds seemed to come and go, about two hours before dusk and in the morning there was bound to be a bird eating the lawn seed. My setup of the balloon was working, it was moving in the wind, when the sun was out the reflective ribbon tied to the tail of the balloon was flashing. The problem was it just wasn’t working. This is when I took the balloon down, and put it up another time. When the balloon went up again it needed to be inflated, after that it was good to go, a whole of five minutes to set up. Unfortunately it didn’t seem to have any more persuasion on the birds. They still hung around especially at dusk and dawn when the birds have decided its time to eat. The birds were onto this one in less than 24 hours, which doesn’t sit well for the bird balloon. The bird balloon also started to deflate quickly, although it did hold it’s shape. The plastic is such that in the sun it will heat the air inside causing it to expand and look inflated, and in the cold look deflated. With some of the functions on the balloon (the same shape eye as a predator, the reflective tail), maybe the creators aren’t as interested in fooling the birds, as they are in fooling the customer. You could easily take this down and put it up when required, it does not take much to put in place when inflated. Bird-X SE-PAC Scare Eye Balloon, 3-Pack can be used to deter birds, are easy to use and easy to remove.